Why Do You Need a Grill Thermometer? A grill thermometer is an important but often overlooked accessory which is very important to outdoor grilling. Many people don't pay attention to whether a grill has a thermometer when they buy one, but it can definitely help your cooking. It is simply a thermometer which tells you the temperature inside your grill. When you close the lid of your grill to roast your food, you don't have any idea what is going on inside! It may be 800 degrees inside, charring your food quickly, or it may be too cool and your food will cook very slowly, unevenly or not at all. A grill thermometer, not to be mistaken for a meat thermometer, helps you know when the interior of your grill is just right for cooking the food you want to cook, the way you want to cook it. 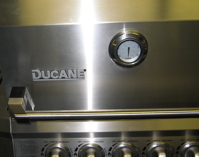 Many grills, both charcoal and gas, come with built-in thermometers in their lids. Others do not. If your grill does not, they can be bought to add on to your existing grill. What do I need a grill thermometer for? For direct heat grilling, a meat thermometer is not as critical. Your lid is up so you can directly see and feel the heat at your grill surface for fast searing of foods. Holding your hand a few inches over the grill grid is an easy way to tell if you have enough heat. If it is uncomfortable after just 2 or 3 seconds, you probably have enough direct heat for high temperature searing of foods. However, for indirect heat grilling you want adequate ambient heat inside all of your grill when you close the lid. There is no easy way to determine this without a grill thermometer. The thermometer tells you exactly what temperature it is inside the grill while you slow roast larger cuts of meat. For big roasts like whole poultry, a while rack of ribs or a leg of lamb, having the right temperature inside your grill is critical. What do you do if your thermometer tells you you don't have the correct heat? For a gas grill, you simply turn your burners up or down to adjust the heat. For a wood or charcoal fuel source it is a bit trickier but easy once you get a little practice. Adding more charcoal will help to slowly bring up the heat in your grill. Also, opening your grill vents wider will allow more oxygen to get to the embers, causing them to burn faster and hotter, increasing the heat. Some charcoal grills also have the ability to change the height of the grill grate over the charcoal. Moving it closer will increase the direct heat, further away will lessen the heat. So a meat thermometer is an important tool in your grilling armamentarium, especially for indirect heat grilling of larger roasts. Done with the Grill Thermometer page?